This entire sequence coming up was supposed to take place in VERY heavy snowfall. The idea is that their vision is pretty limited, which leads to some bickering between the crew. But when it came to actually doing the art, I was afraid that too much snow on the page would obscure the art to a point where it would become hard to tell what was going on. And I figured all that snow might become annoying to look at for several pages at a time. So I lightened it a bit visually for the sequence, although it is a bit heavier than in the other scenes. The uber-observant might notice that the falling snow is also elongated and moving diagonally. To really capture the feel of the bad weather conditions, I wanted it to look like a driving snow, not a light snowfall. So I tried to give the snow some directionality to get that windy feeling across. Did anyone else find themselves scanning the ridgeline behind our crew looking for our mystery stalker? I think you did a great job with the snow. I’ve been in that kind of weather many a times. First, I love your comic. You’re doing a great job and it’s fun reading. However, I am aware that although the snow is falling heavy in the front, the background is still visible very clearly. I think a bit of white dust at the horizon (in front of the mountains) would do it. Good point, Chris. The art is already done for the web postings, but I might add that snow haze for the graphic novel. 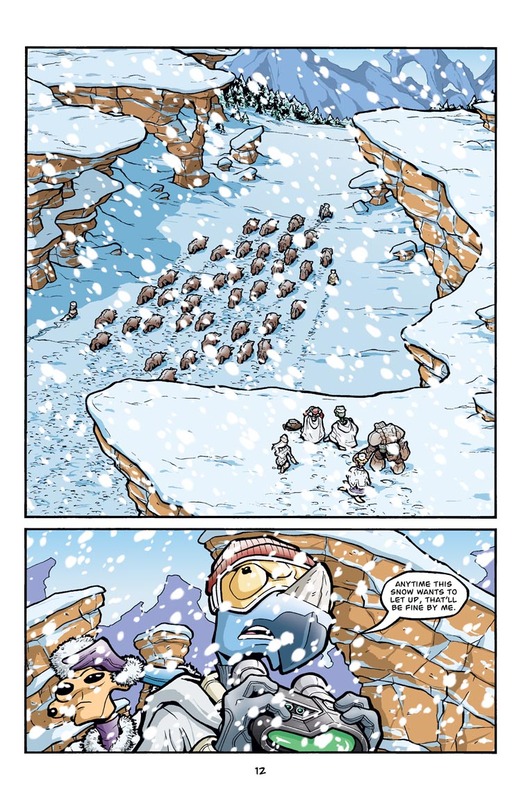 It was bugging me that in some of these heavy snowfall pages, something looked a bit wrong but I couldn’t figure out what. Now that you mention it, I think the fact that you can see the backgrounds so clearly diminishes the intended effect. Thanks for the input! The parkas are not being blown by the wind. I think that would do more for a sense of bad weather than anything you could do with the snow. Also, i have to agree with Chris about the visibility.